Comfort food makes winter nights bearable. Sunshine is at a premium, the cold and dark take over and often makes us homebound – and hungry. One of my favorite go-to dinners on cold nights is chili. It’s an easy dinner to make and – bonus! – make enough, and you have leftovers for dinner and lunch throughout the week. Today was one of those Sundays. You know when it strikes you that your week is os full of work, social engagements, and more work. The obvious solution is to cut back on the social engagements, but this week I have a fun happy hour, a class at the University of Colorado School of Medicine, and one of my best friend’s birthdays! Keeping all of that in mind, I hit the grocery store, stocked up on veggies and healthy-ish snacks for the week and settled into the kitchen for a night of chili making. This particular Sunday was also the now-famous Broncos-Steelers game. I had friends at the game and watching the game; I had decided to avoid watching – I always get sucked in, and I think most Steelers fans are annoying. Making a pot of chili was the perfect way to spend my evening. When I was growing up my mom made really good chili. She used beef, red kidney beans, chili powder, onions – the usual. It is always delicious. I will never forget the time she used really spicy chilies – to this day she can’t recall if they were chipotles or jalapenos – and our unseasoned palates just couldn’t take it. 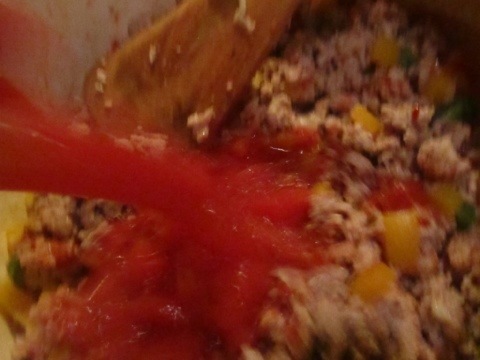 We tried everything; ice, more diced tomatoes, sour cream, milk, extra cheese, more ground beef. Eventually, we persevered and finished the chili. It should be noted that all the Moran kids (now adults!) grew up to be enthusiastic eaters. Thirty years passed before deciding I liked asparagus. Now, I can’t wait until spring. I’m convinced if my younger sister, Jenn, tries it in different ways, she will also love it. The following is my turkey chili recipe. It’s adapted from Whole Foods Market recipe, which I used mainly for measurements and flavor profile. I like to use turkey because it’s leaner and has a lighter flavor than beef. If you’re a chili purist (or jerk), feel free to use beef. Heat oil in over medium heat a large pot or Dutch oven (4 quart works well). 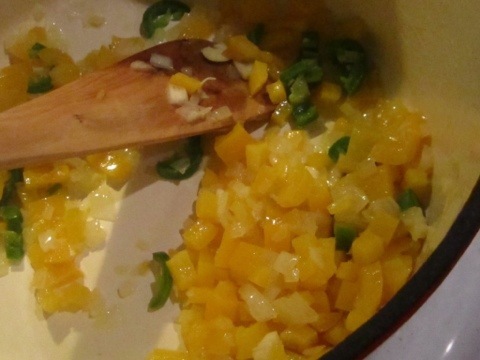 Add onions, peppers, and garlic to pan and heat through until onions are translucent and peppers are soft, about five minutes. 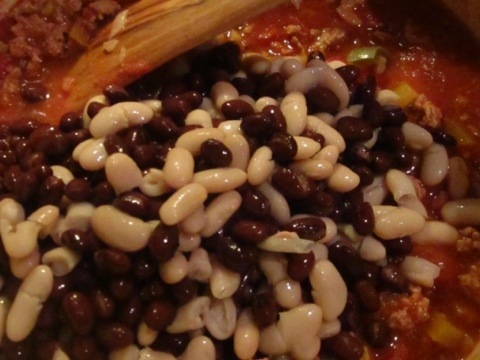 Cover and cook for 30-45 minutes, stirring occasionally Stir in the beans and cook another five minutes to cook through. Optional: Serve chili with grated cheddar cheese, chopped green onions, and/or sour cream. I like mine plain. 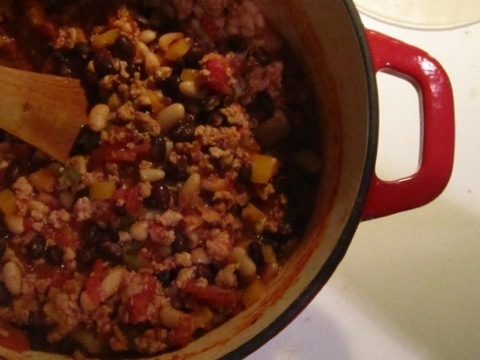 This chili is great the day you make it, and even better the next day.